Dynamic innovation and cutting-edge technologies are shattering the boundaries of content and opening up limitless opportunities. The media and entertainment industry is rapidly growing, making the NAB Show®, the National Association of Broadcasters, a place to break free from conventional thinking and open minds to the future. Attendees from Park Road at this years show included Ian Bidgood, Director of Engineering Picture, James Marks, Head of Technology, and Anthony Pratt, Workflow Architect. 2016 showcased the multifaceted industry with sectors present including Broadcast, Digital Media, Film, Entertainment, Telecom, Post-Production, Academia, Advertising, Military, Government, Retail, Security, Sports, Live Events, Online Video, IT, Virtual and Augmented Reality. All converging in Las Vegas for six days in April to embrace the immersive experiences reshaping the new reality of media. Ian was on look out for product innovation that could play a role in the future of the film industry. “Two demonstrations which stood out in the NAB Show® were in the display area; these being large venue screens and see through OLED screens”. Planar, an American display provider, caught the eye in these product areas. The large venue screen showcased a very tight pixel pitch of 1.2mm or smaller, compared to standard LED models of around 3mm. Some are now even supporting HDR10, the standard for High Dynaimc Range viewing. 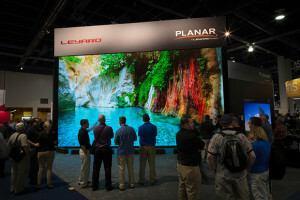 This being so, Planar’s large venue screens were amongst the awards at the NAB Show®. The 55-inch see through OLED panel; Planar’s second successful product, was unveiled to inspire the replacement of normal glass windows in place of the extremely bright and colour rich panels. The OLED panels could soon replace windows on public transport and other such things; and not just for advertising, but for enhancing a consumers experience round the clock. While on the bus to work one may feel like they are passing through a different tropical paradise. These screens certainly have a place for the future. 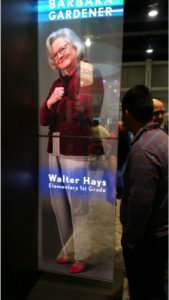 The way we are displayed media as consumers is becoming more engaging each year, with display providers continually innovating to give users a higher quality experience. Filmmaking can only get better with the improvement of its means of display.